To receive updates about Ocean Tipping Points, sign up with your email address below. Kruger National Park (“Park”) is a 7,500 square mile, highly visited protected area in northeastern South Africa, home to many of Africa’s large charismatic species including elephants, lions, hippopotamus, and giraffes. The park brings in over 1.3 million visitors each year and is an important part of the country’s tourism economy.1 Kruger National Park was created in the early 1900s to establish formal protection for dwindling wildlife populations in the region.2 The park manager’s have been successful in boosting wildlife populations, particularly elephants. Early observations in Kruger National Park indicated that, in addition to fire, predation by booming elephant populations was impacting vegetation.2 Initially numbered at 100 individuals when Kruger National Park was established, the population reached 7,000 by 1967. 1 Elephants are voracious grazers and spend up to 80% of their days eating. In an effort to find more food, they often uproot trees and other vegetation, scraping away bark and leaving trampled landscapes behind. When elephant populations are below a certain threshold, vegetation is diverse and supports many animal species. However, when elephant numbers get too high, they destroy large regions of plants and trees, and subsequently endanger the Park’s biodiversity. 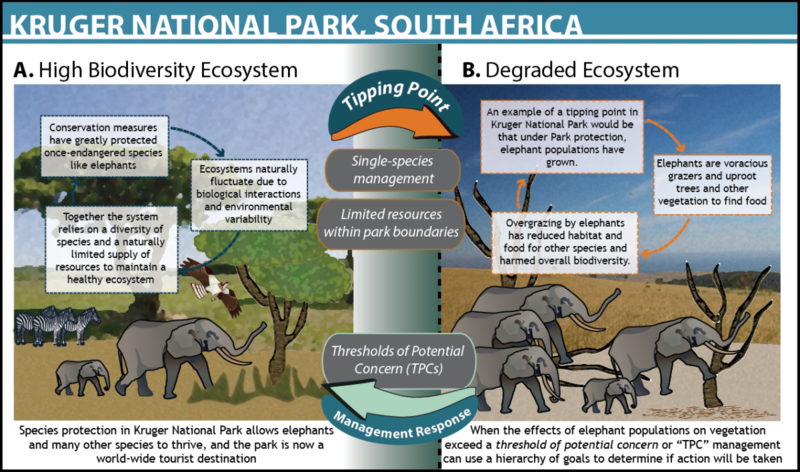 The tipping point between elephant density and vegetation loss is one among many tipping points that Kruger Park managers monitor, including ecological thresholds in river water quality, fire, invasive species, endangered species, and elephant populations. Early ecosystem management in the Park was founded upon the belief that ecosystems behave in a predictable way and revert to some “original balance”. 3 However, new scientific understanding of ecosystems as complex and sometimes unpredictable is shifting managers’ perspective. Through scientific research, managers have begun revising their actions to reflect the understanding that ecosystems are naturally variable, dynamic, and complex. 3 In 1997, Kruger National Park managers developed a set of operational goals called “Thresholds of Potential Concern” or “TPCs” that define a range of environmental outcomes that are socially acceptable and can be used in adaptive management of the Park. TPCs are measures of a specific environmental variable that help managers identify when the environment is outside of a desirable state.4 These limits reflect the management objectives of the park, which are characterized in a hierarchy of broad goals such as biodiversity and human benefits (e.g., tourism). In turn, each of these broad goals consists of sub-goals that pertain to specific species or processes that can be monitored and measured within the Park’s ecosystems.2 This pecking order of goals creates a system of tradeoffs whereby, in a resource-poor system, objectives higher up in the hierarchy receive preferential management. Under this new strategic framework, the management of elephant populations has changed. Instead of managing for the number of elephants, Kruger National Park monitors the impact of elephants on vegetation loss with a goal of maximizing human benefits. Since culling was banned in 1995, the population of elephants has doubled again to 14,000 individuals and the impacts from elephants on vegetation have passed the pre-determined threshold, triggering an evaluation of whether management action should be taken. However, under this new system of management, the social value of tourism—observing elephants in the Park—is valued similarly to vegetation diversity and the TPC can be revised to reflect the dominant preference towards tourism. Kruger National Park’s current management system illustrates the challenge of integrating tipping points into decision-making and highlights tradeoffs in social and ecological outcomes, depending on how managers choose to react to crossing the thresholds of potential concern. Previous management that focused on single species or environmental attributes may have indirectly harmed other species or aspects of the environment. For example, managing only for the health of elephant populations indirectly harmed vegetation biodiversity. Ecosystems are now understood to be highly interconnected and dynamic, and the current framework of adaptive management includes an understanding of these fluctuating interactions among species and with the environment, as well as an explicit mechanism to incorporate social preferences. However, the framework is biased towards the interests of managers and tourists, which need to be balanced with those of surrounding communities. The usefulness of TPCs comes from the creation of a hierarchy of social and ecological objectives that guide management decisions, allowing for species and ecosystem issues and human interests to be discussed and managed under a set of unifying goals. The adaptive management framework in Kruger National Park clearly values and defines different ecosystem benefits, allowing managers to better understand whether going over a particular threshold is desirable. Moreover, the system ensures consistent monitoring of key ecological indicators—representative of broader ecosystem shifts—and identifies thresholds of concern on geographic scales relevant to the projected tipping point as well as management action. Today, the question remains whether Kruger will allow elephant populations to remain abundant throughout the park or intervene to control or decrease their populations and restore vegetation biodiversity. Given tradeoffs among the diverse social and ecological values associated with these different management actions and their consequences, the issue will likely continue to be debated for years to come. As the Ocean Tipping Points team has come to understand, the most successful scenarios for resource management occur when management is threshold-based, populations are monitored routinely, and the geographic scale for management is relatively small. Learn more about our Management Review research and Ocean Tipping Points project. 3Scholes, R.J., and J.M Kruger. 2011. “A framework for deriving and triggering thresholds for management intervention in uncertain, varying, and time-lagged systems.” Koedoe 53(2), Art. #987. 8 pages. 4Gillson, L, and K.I. Duffin. 2007. “Thresholds of potential concern as benchmarks in the management of African savannahs.” Phil Trans of the Royal Society 362(1278): 309-319.